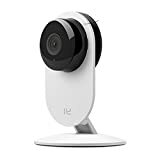 Streaming home security cameras are wildly popular right now, and the YI Home Camera is one of the most popular low-cost models. It includes all the features you would expect from comparable cameras, but it costs just $29 on Amazon. Did we say $29? Add two of them to your Amazon shopping cart and use the coupon code 49HH9WAG at checkout to drop the price down to just $20 each. And if you’re looking for a more capable camera to complement these two, check out the $35 YI Dome Camera that you can pan and tilt remotely using the accompanying app. We told you about this deal earlier in the week, but it’s still available now and it bears repeating. Guys… two YI cameras for $20 a piece! Go get ’em.